'Whiplash the Cowboy Monkey' stole the show as the halftime act during Sunday's Bengals game. 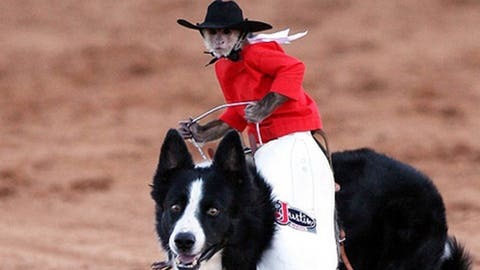 Monkeys riding dogs, herding sheep…what?!?! I mean seriously, what in the world did I just watch? A monkey, riding on a dog, and chasing after sheep=insanity. Whoever thought up this halftime show knows exactly what America wants, football, dogs, and monkeys. I laughed, I cried, and I thought about cuddling dogs and monkeys all in one. What an emotional roller coaster. No doubt PETA is going absolutely insane over this, but you can’t tell me the dogs and monkeys weren’t having fun during this performance. The sheep had a tough day, but hey all’s fair in show business. Cincinnati Bengals halftime show game is absolutely untouchable. Is there anything monkeys can’t do?